Read this post on Asymmetrical Information. It would seem to outlaw both of quite a few bikes no matter how you read the law. You would think that not having the wheel fly off is incentive enough to secure it properly, but if someone says “it’s for the children” then it must be a good idea. Carlson and another plaintiff, Andrew Leong of Brookline, Massachusetts, spoke at a news conference organized by the Center for Science in the Public Interest and the Boston-based Campaign for a Commercial-Free Childhood. They intend to sue Kellogg and Nickelodeon parent Viacom Inc. in state court in Massachusetts and served the required 30 days’ notice on Wednesday. It’s as if this woman’s children have their own money and do their own grocery shopping. Furthermore, I have it on good authority that children existing before television. Why not just take that away? Why aren’t we calling in some sort of family services on people who can’t control their kids? And campaign for a commercial free childhood? Triple the heads, triple the power! 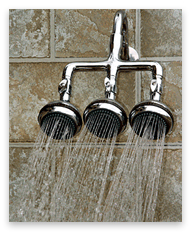 Ladies and gentlemen, I give you the Triple Shower Head. No longer live according to the artificially low federal limit! I like the captains’s quarters the best. And of course, the government might take it away.